13 Nov Waning restocker demand waiting for more rain. 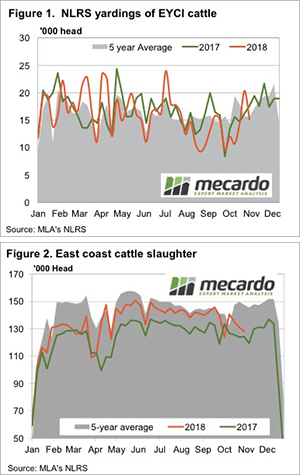 There has been more rain about this week, but it couldn’t stop the Eastern Young Cattle Indicator (EYCI) falling. Young cattle prices are coming off six-month highs, and we thought the Melbourne Cup was supposed to the stop the nation, but it only stopped a few thousand cattle. Figure 1 shows there was a heavy fall in EYCI yardings this week, with 25% fewer young cattle hitting the yards. It wasn’t all on Tuesday in Victoria. In fact, yardings were down all up the east coast. Prices were also down in most centres, which is strange given the rain, but trade cattle prices were relatively steady. Perhaps restockers have their fill of cattle for the time being and are holding off while waiting to see if more rain arrives. The indicators do give the impression restockers cooled off. The National Restocker Indicator fell 17¢ to 291¢/kg lwt, while feeders were relatively steady, and trade steers eased only 6¢ to 287¢/kg lwt. Figure 2 gives a good indication why finished cattle prices aren’t falling with store cattle. The supply of slaughter-ready cattle is on the wane, which is unusual for this time of year. The dearth of grassfed cattle, along with cow retention with a bit of rain, has seen east coast cattle slaughter fall to its lowest full week level since March. Lower Australian supply has seen a rally in export beef prices, they gained 7¢ in our terms this week to 562.5¢/kg swt. The rally was strong in US terms, but improving trade prospects saw the Aussie dollar rally above 72¢. 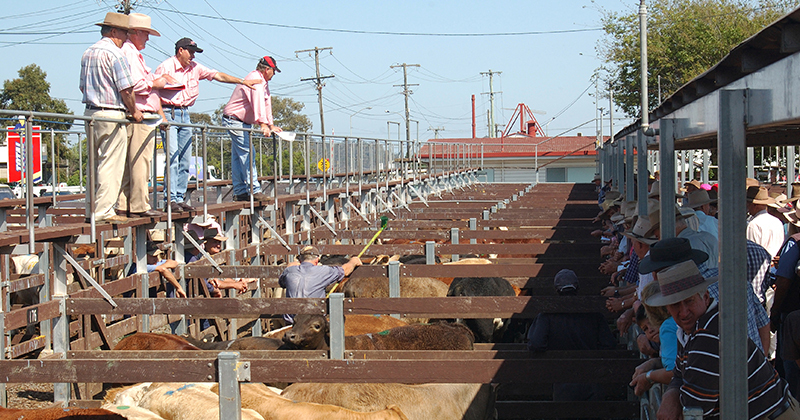 The cattle market is still waiting for that widespread rain which can sustain a price rise. At the moment restocker supply and demand is waxing and waning, seeing some volatility in the EYCI. Finished cattle values have been much steadier and are unlikely to ease until there is a good supply of grassfed cattle again.